The Velocity grille uses solid steel and aluminium rod inserts for added strength and security and yet has the high quality finish of anodised aluminium for superior looks. The Velocity is suitable for shop fronts, malls, counter tops and is particularly suitable for wide openings when a grille is required. The 'VELOCITY' Folding Grille integrates our exclusive 205mm wide 'Wave' aluminium header and footer sections, between a New Zealand designed and manufactured inter-locking single piece Aluminium hinge system. The 'Velocity' Folding Grille incorporates 12mm aluminum tube between the wave panels reinforced with 8mm aluminium and steel rods through the centre of of each tube, reinforced with our proprietary nylon fixing profile. All preparation work should be completed by others. Preparation of openings for folding closures including wood or steel supports, structures, and required clearances should be in accordance with the New Zealand Codes for adequate live load fixing, NOT METAL STUD. Velocity - integrates our exclusive 200mm wide 'Wave' aluminium header and footer sections, between a New Zealand designed and manufactured inter-locking single piece Aluminium hinge system. The 'Velocity' Folding Grille incorporates 12mm aluminum tube between the wave panels reinforced with 8mm aluminium and steel rods through the centre of each tube, reinforced with our proprietary nylon fixing profile. Our track has been designed for added strength - extruded aluminium section 46mm high x 36mm wide. When curved tracks are required we will supply standard radius sections (45° and 90°). Refer to technical guides. Custom curve applications are available, the radius must be nominated (restrictions apply) and a template may be required. 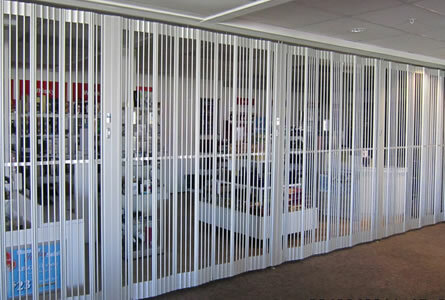 Curtain edges are connected to 32mm wide x 70mm deep extruded vertical posts. In most situations the trailing edge of the curtain will be provided with a top and bottom mechanically retractable locking post. Every folding closure shall be individually assessed for security and locking requirements and when necessary intermediate locking posts added every 2 metres. All intermediate posts are fitted with adjustable concealed drop bolts. Leading Posts are equipped with Euro locking cylinders and euro escutcheons. Cylinders can be supplied in deadlock, snib lock and when needed master keyed. Our locks are designed for the Australasian market. Dust proof floor sockets are provided.